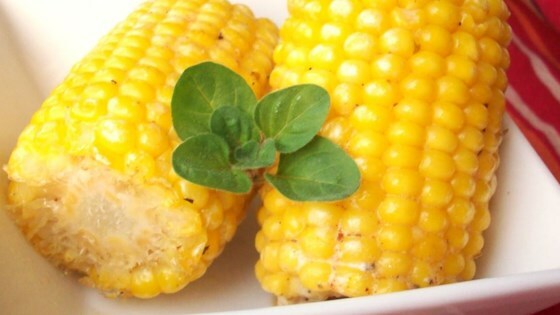 "This is corn on the cob cooked on the grill with spices and butter. It makes for a yummy side dish to any meal! Try it with fresh garlic and onion." In a medium bowl, mix together the chili powder, oregano, onion powder, cayenne pepper, garlic powder, salt, and pepper. Blend in the softened butter. Apply this mixture to each ear of corn, and place each ear onto a piece of aluminum foil big enough to wrap the corn. Wrap like a burrito, and twist the ends to close. Place wrapped corn on the preheated grill, and cook 20 to 30 minutes, until tender when poked with a fork. Turn corn occasionally during cooking. Great recipe for grilled corn - we grilled our corn the way we normally do which is in the husks. After they were done, we spread the butter mixture on top until melted - YUM! What great way to make corn on the cob! It was very flavorful and easy. Will keep this one! This was something different. A good spice mixture. I think I prefer my corn on the cob just with butter tho. None of us really cared for this. I think the cooking time is way too long; at least for our taste. The kernels weren't crispy at all, actually rather soggy.